Moodle with a durian flavour. From Malaysia with love. Moodle and Durian. Moodle Malaysia Boleh! If you are a Moodle 2.x user (Moodle 2.4.1 is the latest as of now - January 2013) looking to speed up your Moodle production site, you might want to check out Cloudways.com's article entitled "Boosting Moodle Performance - Tips To Speed Up Your Moodle Install", Jonathan Moore's excellent "Why Your Moodle Site is Slow: Five Simple Settings", Frederic Never's equally magnificent "Make your Moodle courses load faster without fiddling with the server" and Jonathan Moore's "Why your Moodle site is slow: five simple settings". My article below is still useful, but dated since I was using Moodle 1.9.15 during the time of writing. Anyway, I suppose you reading this because you're desperate for ideas to speed up your slow Moodle site, right? If that is the case, Random Net Surfer, then you've come to the right place! This article was first posted on Moodle.org here on 15th January 2011. At the end of this post, you will know how to speed up your site with mod_deflate. 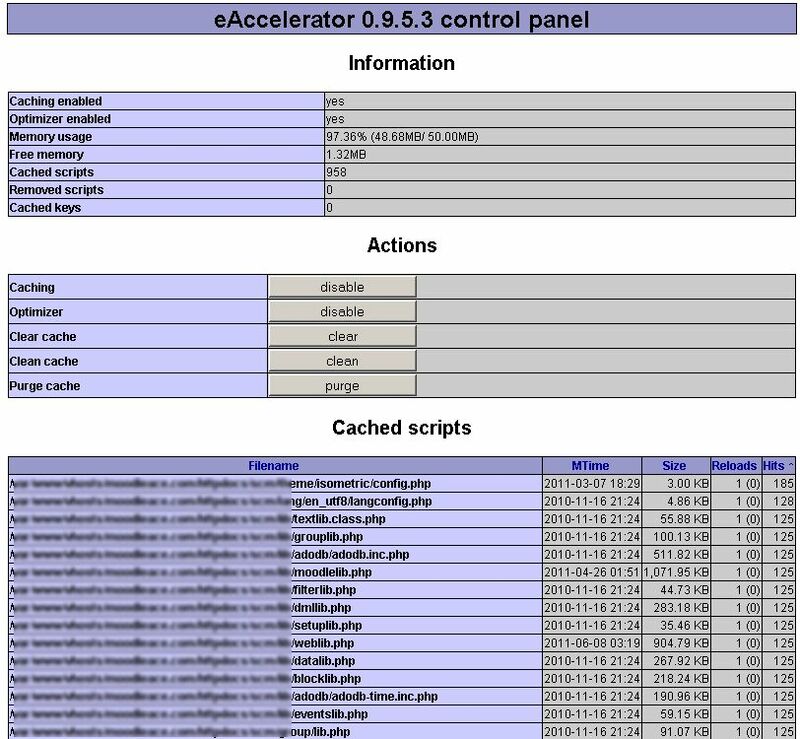 You will also know how to enable PHP caching for your website by installing eaccelerator. Lastly you will know how to monitor your website's resources with munin graphs. 45 days ago, I started by journey of hosting my own Moodle site on a Web Host company. I started off with shared hosting, got turned off by the slow speeds, then upgraded to Virtual Private Server. The site just chugged along but my students complained that the site would load ever so slowly. Now, 1.5 months later, it's a different story. I have spent countless hours and days, while others are asleep, surfing the Net feverishly for ways to optimize and to speed up my Moodle site. I've surfed to moodle.org, googled my way through, gingerly typed detailed Linux commands along the way. BTW, I love Linux now. I've experienced hundreds of emails to and from my Web Host company, had a major server outage, times when my domain didn't load, recovered from a full harddisk due to automated & unmonitored backup files (I can't forget that one! ), blank Moodle pages, loss of data, recovery and backups along the way. I survived. But TODAY, I think I've finally got it. Henry Higgens of "My Fair Lady" would say, "By George! I think (s)he's got it!!!". Anyway....here are two reasons why I am SO HAPPY TODAY. Reason1: My Moodle site FINALLY runs with mod_deflate page compression. Enabling mod_gzip worked fine EXCEPT that on my Linux Moodle site (http://scm.moodleace.com), my images got gzipped. This resulted in the images on my Moodle site not being displayed in their image-holders! Urgh!! 2. Check out your website to see if the mod_deflate is working by surfing to: http://www.whatsmyip.org/http_compression (don't you just love this site?). Reason2: My Moodle site FINALLY runs with eAccelerator (PHP caching) just fine and dandy! Now, iniatially the caching did NOT work. It refused to work and I had no idea why! I setup eaccelerator with these definitive guides. These links have helped me to set up eAccelerator on my 512Mb RAM Linux (Centos 5) Virtual Private Server !!!!! So in desperation, I contacted my Web Host and they gave me some clues. I then surfed somewhere where the webpage mentioned that "eAccelerator only works with mod_php or php in fastcgi mode. It can't be used in cgi or cli because eAccelerator needs to set up shared memory, and this can only be done when all php instances that need to access it are forks of the first process." Aha! The game's afoot! So with guidance from my web host, I setup my Plesk Panel so that php would run not as cgi, but rather as fast-cgi!!! THEN to my amazement and wonder, my pages actually started to cache. Not just a few cached pages, but hundreds of cached pages just by clicking around a few times around my Moodle site. Hallelujah!!! See the attached images to see the caching of my php code working as it should. info until you come to the eAccelerator section. Notice it says 621 pages are cached? the better the surfing experience will be. 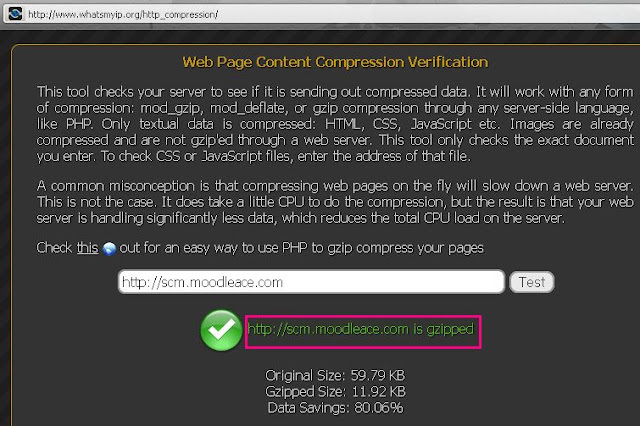 Why am I over the moon with Webpage compression with mod_deflate and Php Acceleration of my Moodle site? Simple! My VPS is running on a measly 512Mb RAM!!! Some of you guys have a Moodle server running on 4 Gigs of RAM!!! And my server's (VPS's) download pipe is trickling in at 512Kbs best effort. Some of you are enjoying 10Mbs or 100Mbs speeds for your servers, you 'lucky' ones you. So now you know why I am so happy to have speeded up my Moodle site the way I have shared with you. here are the specifications of http://scm.moodleace.com: 512Mb RAM, 512Kbps pipe, (Centos 5, Php 5.2.17) Virtual Private Server (VPS). Now all I need is an additional 3.5Gig RAM and a 100Mbps line for my VPS. Ahh..that would be perfect. My limited funds to upgrade my site have run dry. So if anyone else can share with me MORE concrete ways to speed up my Moodle site, I am all ears, and I will be HAPPIER STILL. How can I optimize my MySQL? Anything else I can optimize my Linux Moodle site? Thanks to Sarah Jane for highlighting this very informative and easy-to-understand Youtube video by Chris Coyier on 4 steps to speed up your website. What I love about the video is Chris' style of of narrative, explanation and presentation visuals of making the concepts simple and easy to grasp. If you have another 28 minutes to invest in speeding up your website, please watch this video and learn from the expert. Another good link by Kory Prince entitled "How to speed up your Moodle or any PHP-enabled server"
More tips can be found on this very nice post on Stackoverflow. Greg Padberg shares how he increased his Moodle server's speed in this forum. Very instructive. Yulstar shares here how he speeded up the processing on his Moodle development server three times. Tim Hunt has this tip to increase the speed of large Moodle sites. Verified by CP Lau. It is interesting to note here that eaccelerator may not be the best PHP caching software to use. There are alternatives. Please also read Tim Hunt's excellent blog post on performance-testing Moodle. 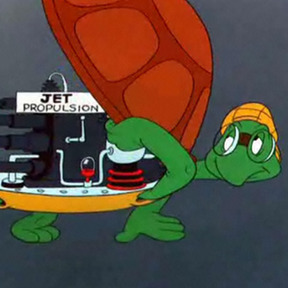 Lastly, here's a wealth of information on increasing your Moodle site's speed. 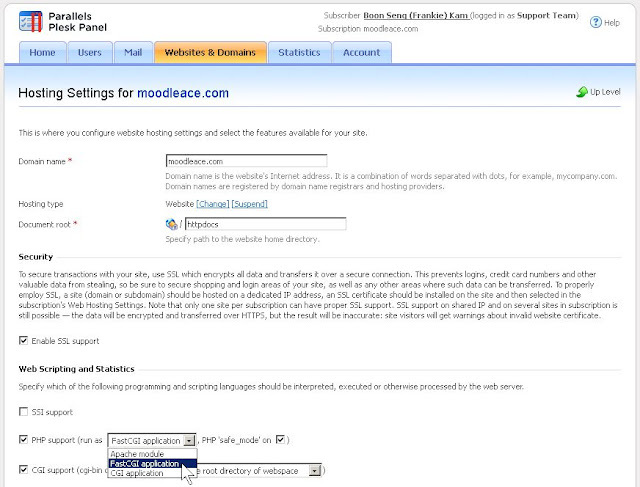 More material on how to enhance the performance of Moodle 2.5 here. otherwise leaving a comment (or a compliment) below will last me a month! hi, im interested with moodle.. setting my moodle 2.1.1+ on my centos 5.4 webserver with static ip. Hope will learn more from u..
Hi Izhan! Salam 1Malaysia. Glad to hear from you, bro. How much RAM is your system? 2GB. my moodle is running well but slow in loading pages. thanks for your post.. i successfully install e-accelerator and work great!!! Iz, YOU THE MAN!!! Memang hebat-lah you! CONGRATULATIONS on installing e-accelerator! I bet you notice the difference straight away. Previously the pages load like line by line, now they just load immediately right? So user satisfaction of using Moodle will zoom up how many peratus (%)? And you have 2Gb of RAM! Saya punya 512Mb RAM. Moodle rocks. Malaysia Boleh! Iz, may I know, where are you from (state)? i live in Melaka.. my pages running very fast now, i think more than 80%. 5 Tips. Give it a try! If your Moodle 2.2 or 2.3 is running slow, another tip is to upgrade to the latest Moodle version. 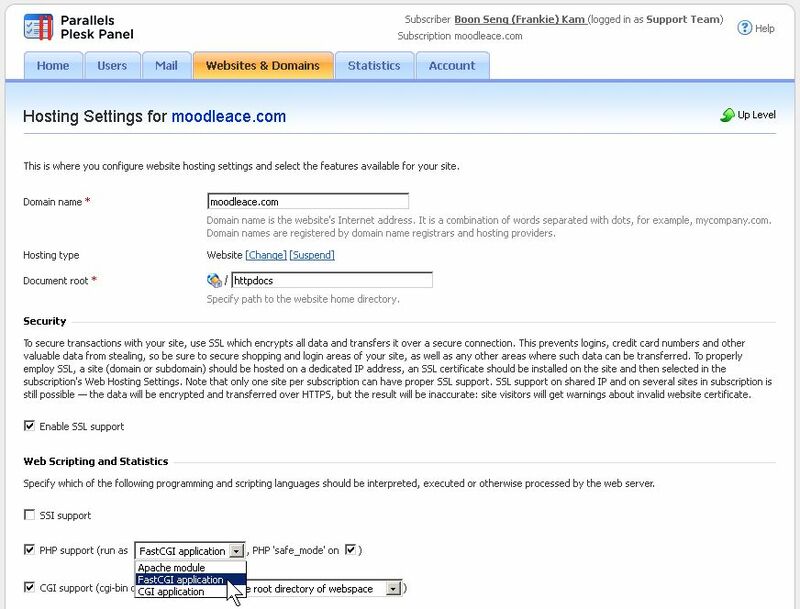 Install and use Moodle 2.4 with supercache built in. Hello! I have read your instructions on gzip, and while I could enable it in php.ini successfuly, I have the same problems as you had with the images. Since I am running my Moodle site on a shared host environment (NTCHosting) I am not able to play with any files related to linux installation. Is there any way to disable image compressions in php.ini or .htcaccess? Hi Marton. I don't know the answer to your question. Why not raise the question in the forums of moodle.org? Works for me. Hacking Moodle code (PHP) is like tackling a durian. You have to prise it open with care minding the spiky thorns. Once past this stage, you can enjoy the creamy fruit that lies within. So it is with these hacks. Navigate carefully past the perilious code hacks/mashups and you will enjoy the power of Moodle to enhance your classroom! Disclaimer: If you want to use these hacks on your own production site, you do so at your own risk. If you need any help with any of the hacks on my blog, feel free to email me at boonsengkam@gmail.com. I'd love to hear from you. Cheers. The best way to create Moodle quiz questions for Microsoft users. Period. Frankie Kam (2016). Theme images by molotovcoketail. Powered by Blogger.